Dallas Shooting Gunman: What We Know : The Two-Way Law enforcement officials briefed on the investigation have identified the gunman killed in Dallas as Micah Xavier Johnson. The Pentagon says Johnson was a military veteran who served in Afghanistan. This undated photo posted on Facebook on April 30, 2016, shows Micah Johnson, who was a suspect in the sniper slayings of five law enforcement officers in Dallas on Thursday night. 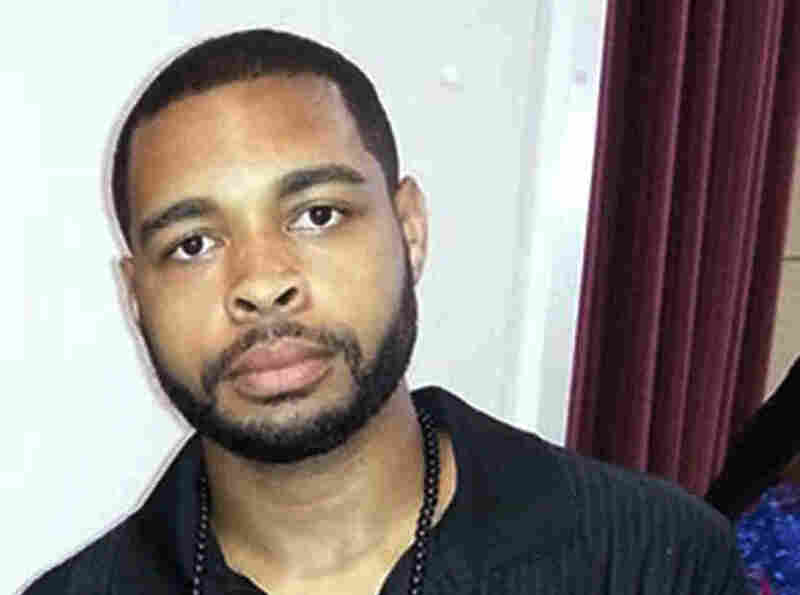 The name of the suspected gunman killed in Dallas is Micah Xavier Johnson, two federal law enforcement officials briefed on the investigation tell NPR. The 25-year-old suspect was killed in a parking garage by a bomb deployed by police, following hours of failed negotiations, Dallas Police Chief David Brown said Friday morning. The suspect was later identified as Johnson. You can read our full coverage of the attack that killed five police officers here. "The suspect said he was upset about Black Lives Matter. He said he was upset about the recent police shootings. The suspect said he was upset at white people. The suspect stated he wanted to kill white people, especially white officers. ...The suspect stated that he was not affiliated with any groups, and he did this alone." Two law enforcement officials told NPR's Dina Temple-Raston that they believe the suspect had been planning an attack for some time and acted on his own. They added that they have not identified a connection between the suspect and any international terrorism or domestic extremist groups. Johnson had no criminal history, the Dallas Police Department said, and people interviewed during the investigation have identified him as a "loner." "During the search of the suspect's home, detectives found bomb making materials, ballistic vests, rifles, ammunition, and a personal journal of combat tactics," the police department said. It added: "Detectives are in the process of analyzing the information contained in the journal." Law enforcement officials have provided NPR with what they believe is Johnson's manifesto. As we reported, "In the short purported manifesto, the writer points to police shootings of black Americans as his motivation and criticizes the Black Lives Matter movement." Three weeks before Johnson opened fire in Dallas, he volunteered to provide security and help maintain order at a Dallas anti-Trump rally on June 16, reports Bill Zeeble of KERA News. When the shooting suspect offered to help with the rally, Rev. Peter Johnson, a key organizer and long-known Dallas civil rights leader who marched with Martin Luther King Jr., and others, said no, because Micah Johnson wanted to bring his gun. "Young man comes, says 'I'm going to participate, I want to help. But I want to bring my gun,' " Rev. Johnson recalls. "I say, "Hell no, you can't bring your gun.' I told him you can't bring your gun to a protest that I'm involved in." The Pentagon told NPR's David Welna that Johnson served in the U.S. Army Reserve from March 2009 to April 2015. That included a tour in Afghanistan from November 2013 to July 2014. He also served in Seagoville, Texas, and is listed as a carpentry and masonry Specialist. Johnson achieved the rank of private first class in May 2010, according to his service verification record from the Pentagon. At the time of his entry into the military, his address was listed as Mesquite, Texas. Afghanistan Campaign Medal with campaign star: Awarded to personnel who serve in Afghanistan for 30 consecutive days or 60 nonconsecutive days. Army Achievement Medal: Awarded for "non-combat meritorious achievement or service." National Defense Service Medal: Awarded for "honorable active military service." Global War on Terrorism Service Medal: Awarded to personnel serving during the "Global War on Terrorism" for "30 consecutive days or 60 nonconsecutive days." Army Service Ribbon: Awarded to members of the Army for "successful completion of initial entry training." Armed Forces Reserve Medal with "M" Device: Awarded to members of the Reserve who were "called up involuntarily to active duty." NATO Medal: Awarded to military personnel and civilians "who participate in designated NATO missions." As we reported, police said earlier that they took three other suspects into custody. The Dallas Police Department said that 25-year-old Brandon Waller "was arrested for unrelated weapons charges at the scene on July 7, 2016," without clarifying whether he was one of the unnamed three suspects mentioned previously. We'll keep you updated as more information comes out about the suspects.